Friday, September 28th, 2018, Rockville, MD. Cardiovascular disease is the leading cause of death and disability in the world. 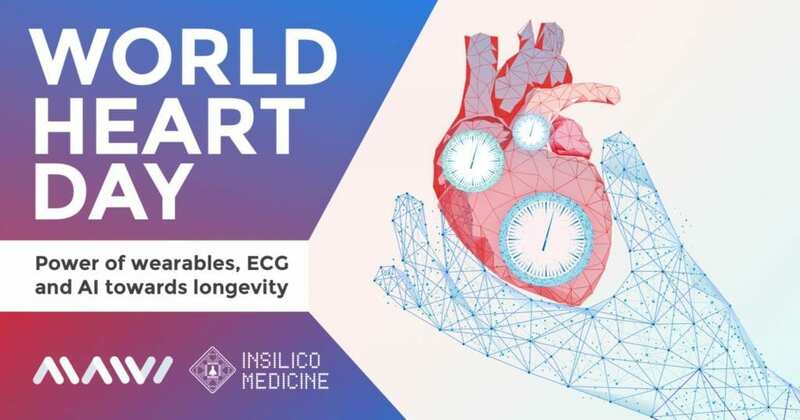 On the eve of the annual World Heart Day, September 29th, Insilico Medicine, Inc., a Rockville-based next-generation artificial intelligence company specializing in the application of deep learning for target identification, drug discovery and aging research announced a research collaboration agreement with MAWI, the next-generation consumer and clinical wearable company, the developer of one of the most accurate clinical-grade ECG wearable devices. The aim of the collaboration is to develop a range of multi-modal biomarkers of aging and mortality to help prevent the onset of cardiovascular diseases and extend human longevity. "We believe that the revolution in the accurate ECG sensors will start with MAWI which will complement any smart watch solution with a range of specific applications geared towards extending longevity and healthspan of the individual. At MAWI we value great science and research-backed applications and a partnership with Insilico Medicine will help us deliver new longevity-focused solutions to clinic faster", said Ron Fridman, founder and CEO of MAWI. The first phase of ECG data collection with future research study by Mawi will be conducted in collaboration with the Preventive Medicine Center "Edem Medical". Both companies will collaborate on research programs devoted to the development of electrocardiographic age predictors of cardiovascular dysfunction. MAWI uses clinical-grade hardware to collect and process the information. Insilico Medicine's technology applies advances in deep neural networks identifying biomarkers of aging of multiple modalities. Insilico Medicine regularly publishes new research on aging biomarkers developed using various available data types and allows for the testing of these biomarkers via the online portals including Aging.AI and Young.AI. "Wearable devices present an opportunity to develop non-invasive biomarkers of aging and mortality and can help build multi-modal trajectories of human and animal health. With the advent of novel digital tools we can move from treatment to prevention and repair the age-associated damage", said Alex Zhavoronkov, PhD, founder and CEO of Insilico Medicine Inc.
MAWI Solutions is a MedTech startup, we develop wearable electronics and cloud solutions that use artificial intelligence. (http://www.mawi.band) Mawi mission is to develop, manufacture and market AI-powered healthcare products and biosignal data analysis solutions for consumers and medical professionals. Our main product is a medical-grade portable wristband ECG device. Insilico Medicine, Inc. is an artificial intelligence company headquartered at the Emerging Technology Centers at the Johns Hopkins University Montgomery County campus in Rockville, with R&D and management resources in Belgium, Hong Kong, Ukraine, Russia, UK, Taiwan, and Korea sourced through hackathons and competitions. The company and its scientists are dedicated to extending human productive longevity and transforming every step of the drug discovery and drug development process through excellence in biomarker discovery, drug development, digital medicine, and aging research.